As we roll out new report types using Questionmark Analytics, we are pleased to provide short how-to’s explaining their uses and features. What it does: Compares course evaluation information across courses. 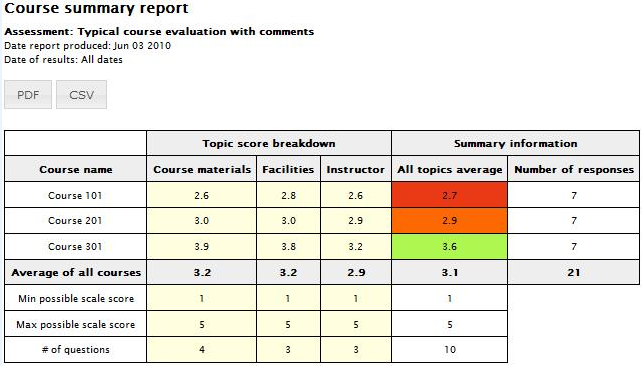 The course summary report has a dynamically generated table representing the summary survey scores for all topics in each course. Who should use it: Useful for managers and learning/education/training professionals to gauge and compare how participants rate different courses offered within an organization. A dynamically generated table displaying the average ratings for each course in each “topic” (or group) of questions. For example, a course evaluation might group questions about “course materials” in one topic, and questions about “facilities” in another topic. The table includes data about the questions, ratings and number of responses – and is color-coded to highlight the high and low performing courses. A bar-chart that graphically compares the average aggregate ratings for each course. 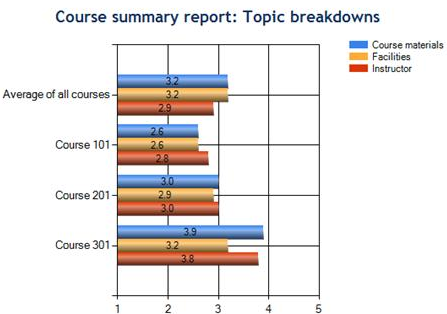 A bar-chart that graphically compares the average ratings by topic for each course.